PULASKI, WI – Edward R. O’Brien Jr., 74, Pulaski, passed away peacefully with his family at his side on Friday, August 17, 2018, at Bellin Hospital in Green Bay, WI. The son of Edward Sr. and Dorothy (Carriere) O’Brien was born September 21, 1943, in Ishpeming, MI. Edward was a U.S. Army veteran and had served his country from 1962 – 1965. On July 10, 1965, Edward married Delma “Chris” Hanson in Milwaukee, where they started their family. They relocated to Ishpeming, MI, where they lived for over 30 years. Ed worked at Cleveland Cliffs Incorporated until his retirement in 2003. After retiring, he and Chris moved to Pulaski to be closer to family. Ed liked the outdoors; especially hunting. He greatly enjoyed officiating high school athletics, his favorite being football games. Survivors include his wife of 53 years, Delma; three children: David (Kathy) O’Brien, Pulaski, Michael O’Brien, Lomira, Jim (Dawn) O’Brien, Hartford; six grandchildren: Allison and Cole, Jacob and Emma, Cayden and Danyca O’Brien; six siblings: MaryAnn (Jerry) Laituri, Ishpeming, MI, Gary (Carol) O’Brien, Ishpeming, MI, Theresa (Randy) Bloomhuff, Ishpeming, MI, Patrick (Virginia) O’Brien, Ishpeming, MI, Timothy (Jan) O’Brien, Sparta, and Paul (Karla) O’Brien, Bonduel; numerous nieces, nephews, other relatives and friends. In addition to his parents, he was preceded in death by one infant granddaughter, Colleen O’Brien, and his canine companion, Fluffy. Friends may call at Assumption B.V.M. Church, 119 E. Pulaski St., Pulaski, from 10 a.m to 11 a.m. Friday. The Funeral Mass will be celebrated at 11 a.m. Friday at the church, Fr. Patrick Gawrylewski, O.F.M., presiding. THE FAMILY REQUESTS NO FLOWERS, PLEASE. The family extends a special thanks to Fr. 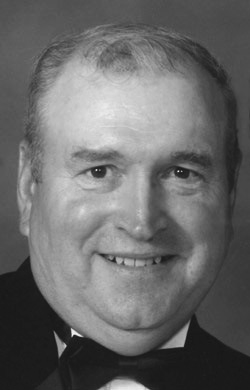 Patrick Gawrylewski, O.F.M. and the entire staff of Bellin I.C.U. for their compassionate care shown to Eddie and the entire family. Online condolences may be expressed at www.marnochafuneral home.com.